UMITSUBAKI HAYAMA is located in the seaside area of Nanki Shirahama, which is in the southwestern part of Wakayama Prefecture. Nanki Shirahama's pleasant climate is so warm all year round that visitors can even experience swimming with tropical fish. At UMITSUBAKI HAYAMA, guests can enjoy the Tsubaki Onsen hot springs, which are known as the “gateway” to the Shirahama Onsen resort area. Shirahama Onsen has a long and distinguished history, and was even mentioned in literature from the Edo Period (1603-1868). UMITSUBAKI HAYAMA is also close to the ancient Kumano Kodo pilgrimage route, which along with the Camino de Santiago in Spain is one of the only two roads listed as World Heritage Sites. Kumano is a fascinating area where visitors can experience firsthand the power and majesty of nature. Since UMITSUBAKI HAYAMA was opened on September 9, 1999, it has been the recipient of the Good Design Award and a number of architectural prizes. 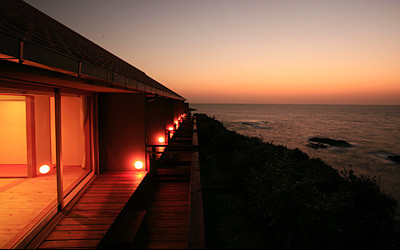 Located on the tip of the coast facing the Pacific Ocean, this ryokan (traditional Japanese inn) features designer style and a peaceful, secluded atmosphere. After spending a few leisurely hours observing the changing sky and ocean before you, you’ll realize that there’s nothing more you could want or need. That’s why so many people come to UMITSUBAKI HAYAMA even from overseas to engage in creative pursuits. UMITSUBAKI HAYAMA serves healthy cuisine made from the bounty of fish and vegetables that the Kishu area is renowned for. ※Rates are the same on weekdays, Saturday, Sunday, holidays, and the day before holidays. Christmas, and the New Year holidays (24,450 - 33,010 Jap.yen). For more information, please feel free to contact us by fax, or e-mail. Payment: Cash (Japanese yen) or credit card (we accept VISA, MasterCard, UC, JCB, Diners Club, and AMEX).